When I think Winter I immediately think – new coats and jackets. It’s not A/W unless I’ve invested in one staple Winter jacket and at least one on-trend jacket to mix things up. This season I’d noticed aviator jackets really making the rounds over on Pinterest in all shapes, sizes and textures and I really wanted to work one into my own wardrobe. I mean aviator jackets look SO COSY and in my opinion so effortlessly cool. Win win! This isn’t a jacket I would wear on a typical day-to-day basis since I work in a professional office environment but once the weekend kicks in I plan on whipping out my aviator jacket! PrettyLittleThing recently got in touch and asked me to team up and style some choices from their current coats and jackets range. This email arrived at just the right time as I was deliberating over what coats and jackets would make their way into my Winter wardrobe. Straight away I wanted to style one of their aviator jackets and there was just too much choice! As much as I wanted to go for the pink suede aviator jacket of dreams, I finally settled on this super wearable black PU aviator jacket. It’s more me. I always like to mix things up with my style and show that anyone can try out new trends while incorporating them alongside their own personal style. While I always love to wear all-black outfits be it at the office or chilling at the weekend I think this outfit has more of a fun feel to it. It’s also a nice way to wear a dress in the colder season while still wrapping up and dressing with a practical sense. I love my new aviator jacket and feel like I’m basically going to live in it over the next months. You have no idea how snuggly it is! The rolled-up sleeves are my favourite touch. 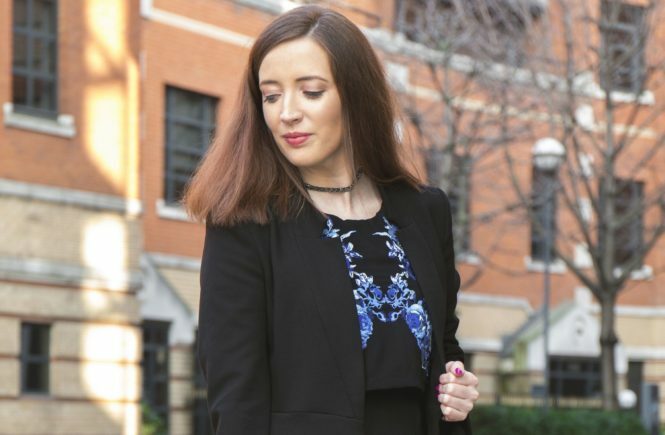 I styled this black aviator jacket with a simple long-sleeved tie shirt dress from New Look and a pair of chunky Emu boots which I hadn’t worn in a long time! This is the first of my Winter Coats Trend Edits here on BecBoop. I’ll be sharing more over the coming weeks. I’d love to hear from you in the comments below! What are your thoughts on the aviator jacket trend? I love the aviator trends as it comes around again this year, i’ve bought two and sent both back because I’m so fussy, I love the faux leather ones but your one looks great styled like that.